This is the largest segment for me of the pre-production of this film as I took two armature sets and decided to scale them down (to make realistic child size to the set) rather than risking the set becoming too large by scaling them up. And so the first stage was in the metal workshop sizing down the armature parts. Silicone parts of the skin and ‘movable’ pieces of these two puppets was the biggest challenge, as it was a new process for me. 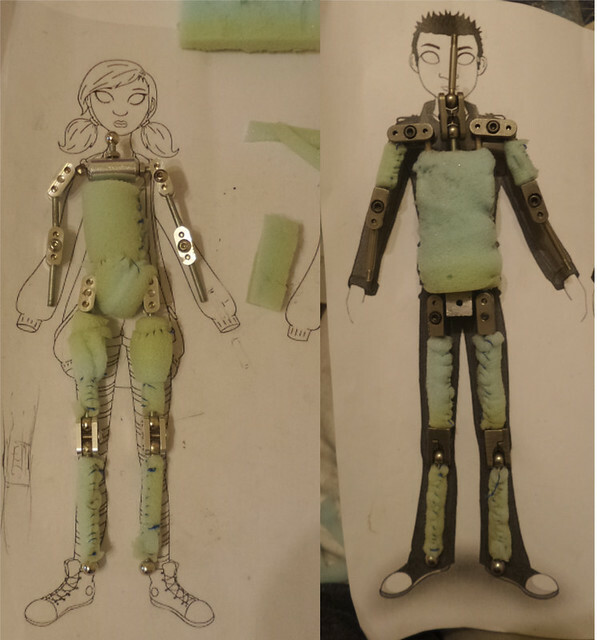 I took these step by step in university while working on other parts of the puppet. The first stage was to make moulds of the sculpted character parts (head, neck, hands, shoes). Using mount board to box in the moulds then making sure to spray with lots of mould spray before mixing up plaster to pour in first halves for the head and hand parts and over the flat one piece moulds for neck and shoes. Then the second halves would be mixed up and poured after making sure the first was fully dried and then re-sprayed. 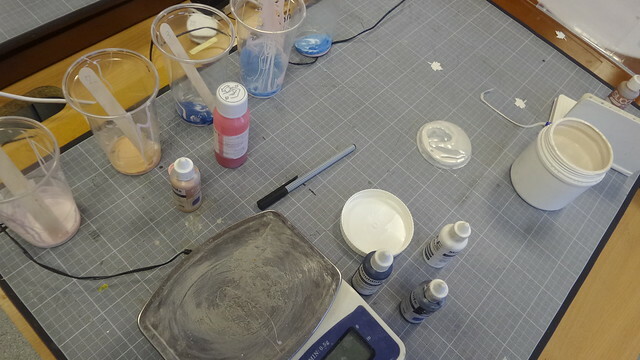 The next stage for Silicone was to Test the silicone itself and try out different mixes of silicone and pigment to see what sort of mix would be needed to get the right sort of colour I wanted for each part. Some would have to be painted afterwards for pigment details such as hair or Shoes so would be cast in the lighter tone of colour as easier to go darker than lighter afterwards. I then cast up the silicone parts with the right k&s tubing or mechanisms inside to make attaching to the armatures later possible (and easier). The first set worked rather well but the shoes did not move as smoothly as I had hoped, the silicone was too strong and so I switched to another brand which was perfect for the process and made for a great pair of shoes with tie downs if I so needed. I also made up several pairs of hands to have replacements if broken during animation. Overall the silicone parts turned out well and were just how I had hoped they would be, keeping to the character designs well. I padded out the body parts to make the armature have an accurate body form shape. This was by sewing foam around the armatures to keep all in place and not move or change shape unrealistically. Then I got to making the clothes. 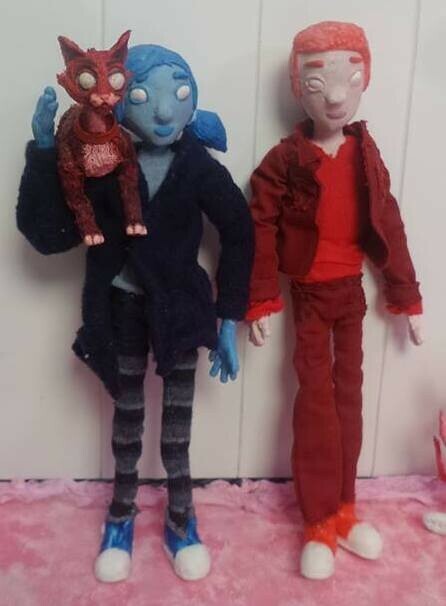 I wanted the fabrics to be unique so I dyed some to test how far I can take the materials I gathered for the puppets. This was an interesting process and I managed to make some great swatches for denim shorts and the stripy tights from socks. I also got various shades of Yellow fabric to pass on to Assistant puppet maker of Yellow Boy Tim. Then started cutting and sewing together parts for the clothing. I put wire into the jumper of Carlina’s to have the ability to hold positions and forms for the jacket in animation if need be. The clothes worked well for Carlina as they fit the body well and looked just how had in the designs. James’s clothing was made from tougher materials that didn’t flow as well therefore making them not as realistic which is a shame. I shall make sure to use much softer fabrics next time. The parts were all then put together to make the final puppets. These are great puppets from the designs and should work very well for the animation stage of work.